The CoLink®NX System uses Tapered Compression Slot Technology to create mechanical compression across the fusion site. Up to 1.5mm of compression is possible using the Compression Slot, an elliptical slot with progressive depth. 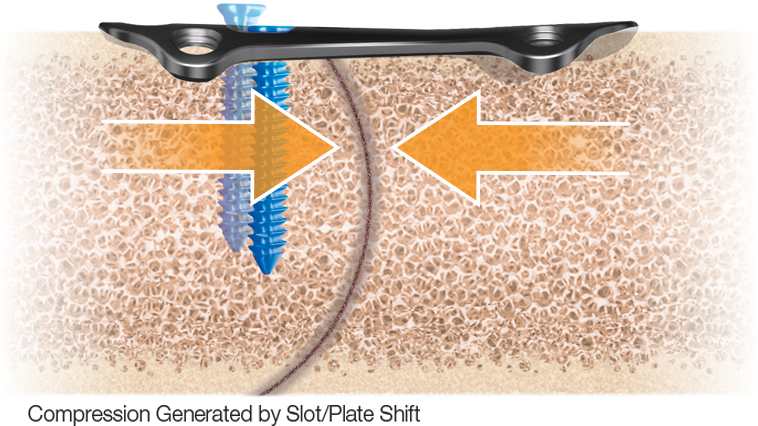 With the Colink®NX Plate, as the non-locking slot Screw is tightened, it seats deeper into the slot, sliding the Plate and attached phalanx proximally, closing and compressing the fusion site. The Compression Slot is featured on the CoLink®NX MTP and Utility Plates. Implants (Plates and Screws) are individually packaged in sterile boxes or tubes for OR efficiency and economy. The Screws exterior tube releases the sterile interior sleeve with the subsequent sterile Implant on the holder and ready for surgery. The color-coded package label identifies the implant type, style, configuration and length. Box and tube labels provide easy identification of the Implant. Screws delivered in easy to open sterile tubes. The Implant package includes Unique Device Identification labeling on a series of self-adhesive labels for convenient and comprehensive implant traceability for hospital and patient records.